The presence of inguinofemoral node metastases is the most important prognostic factor for survival in patients with vulvar cancer. Reported five-year survival ranges from 70 to 93 percent for patients with negative nodes to 25 to 41 percent for those with positive nodes. Other prognostic factors include stage (which encompasses size and depth of invasion), capillary lymphatic space invasion, and older age. For a definition of the stages go here. Assessment of current International Federation of Gynecology and Obstetrics staging of vulvar carcinoma relative to prognostic factors for survival (a Gynecologic Oncology Group study). Analysis of 588 patients with vulvar carcinoma delineated four risk groups by the proportional hazards model. Groin node status (laterality and number positive) and lesion diameter were the only two important independent prognostic factors. The 5-year relative survival rates were 98%, 87%, 75%, and 29% for the risk group categories of minimal (negative groin nodes and lesion diameter less than or equal to 2 cm), low (one positive groin node and lesion diameter less than or equal to 2 cm or negative groin nodes and fewer than two lesions less than or equal to 8 cm diameter), intermediate (negative groin nodes and lesion diameter greater than 8 cm diameter, one positive groin node and lesion diameter greater than 2 cm, or two unilaterally positive groin nodes and lesion diameter less than or equal to 8 cm), and high (three or more positive groin nodes or two bilaterally positive groin nodes), respectively. Applying the International Federation of Gynecology and Obstetrics staging (1988) to these data discriminated risk of death (caused by recurrent vulvar cancer); the 5-year rates were 98%, 85%, 74%, and 31% for stages I, II, III, and IV, respectively. However, within International Federation of Gynecology and Obstetrics stage III there were 47 low-, 95 intermediate-, and 28 high-risk patients with relative survivals of 95%, 74%, and 34%, respectively. 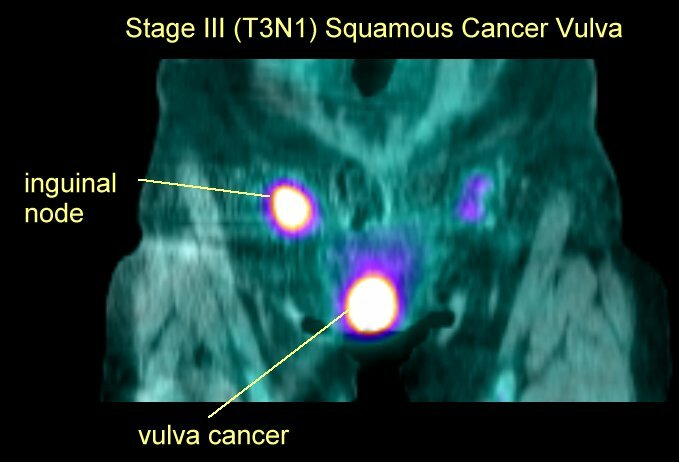 Overall, this assessment validates current International Federation of Gynecology and Obstetrics vulvar carcinoma staging, but further refinements are warranted in stage III.